Guests of the WardJet openhouse at its facilities in Tallmadge, OH, October 23-24, spied numerous new developments in waterjet and abrasive-waterjet technology. On the production floor, visitors (including MetalForming magazine) enjoyed the debut of a waterjet-cutting robot; were introduced to the new Z-series twin-head cutting machines; and learned of the firm’s recently developed 3-ft. Z axis for the Z-series machines, and also available as a retrofit for its R-series cutting machines. 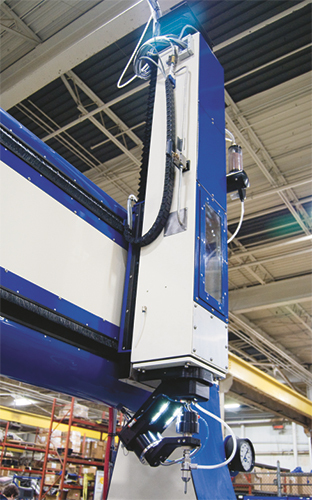 Attracting numerous onlookers was the robotic waterjet-cutting cell (above), starring a Yaskawa Motoman HP20D-A80 six-axis high-accuracy robot. With a 20-kg payload, 1700-mm horizontal reach, 3000-mm vertical reach and path accuracy rated to 0.1 mm, the arm proves perfect for 3D waterjet applications. 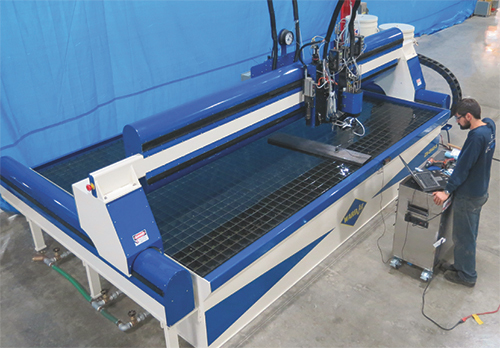 This cell features three distinct cutting areas: a tank for water-only cutting; a tank for abrasive cutting; and a head-tailstock positioner area for cutting of odd-shaped parts requiring a seventh axis. For cell programming, WardJet is working with the new Robotmaster programming module within Mastercam, which allows it to quickly generate robot paths without having to teach every part. WardJet’s new Z series machines (below) come standard with 12 in. of Z-travel, and as an option can feature 36 in. of Z-axis capacity. Included is a pair of cutting heads with independent Y control, allowing independent movement of the heads in any direction, as well as mirroring for assisted cutting. The model displayed included a standard 2D cutting head with drill and tap, and a WardJet Infini Winder five-axis cutting head. This head offers complete 360 deg. rotation without concern for cable wrapping, routing the cables delivering abrasive, water and air through the head’s center of rotation. Lastly, the expanded Z axis (above left) offered by WardJet as an option on any new machine, as well as an optional retrofit, allows for the cutting of larger parts that might not clear the gantry. Most often, the expanded Z is coupled with the Infini Winder cutting head for maximum versatility. The Infini Winder is bottom mounted on 36-in. Z gantries to allow for cutting down the side of parts. Thus, a fabricator cutting tube can drop the cutting head completely inside the tube and cut up or down the side of the tube without having to account for the z-carriage hitting the workpiece.